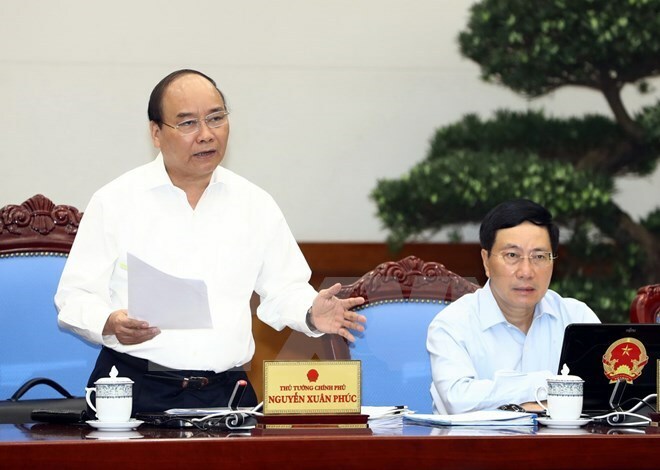 Hanoi (VNA) – Prime Minister Nguyen Xuan Phuc discussed various issues while chairing the Government’s regular meeting for July in Hanoi on August 3, asking officials to take measures to ensure their sectors and agencies reach this year’s growth targets. He said it is necessary to precisely assess problems facing each sector as well as shortcomings so as to address them and achieve 2017’s targets. PM Phuc noted a positive trend in the socio-economic situation in July and the first seven months, saying that inflation continued to be controlled, credit grew well, while export and import revenue increased by almost 19 percent. About 73,000 new businesses were established and more than 17,000 others resumed operations between January and July. He expressed his delight at the implementation of social welfare, cultural, educational, healthcare and poverty reduction policies so far this year, highlighting the good organisation of the national high school examination in July and Vietnamese students’ recent attainment of gold medals at international competitions in mathematics, physics, chemistry and biology. Directed by Party General Secretary Nguyen Phu Trong and the Central Steering Committee on Anti-Corruption, several cases of suspected corruption have been being handled. The Party Central Committee’s Examination Commission also disciplined officials with wrongdoings, creating a strong anti-corruption atmosphere across the entire political system, the Cabinet leader noted. At the meeting, PM Phuc pointed out that although the manufacturing industry expanded, mining activities still shrank. There are still difficulties in production and business activities, as evidenced by 43,000 companies stopping operation, more than in the same period last year. Meanwhile, the trade deficit was high, more than 3 billion USD, attributable to foreign projects importing machinery. He also expressed his concern about the spread of dengue fever, with more than 60,000 cases and 17 deaths recorded this year. He asked Government members to devise ways to remove bottlenecks and achieve the growth target of 6.7 percent in 2017, suggesting attention be focused on production and business expenses, expenses involving administrative procedures, disbursement of public investment capital, deforestation, illegal mining and dengue fever prevention.